St. Marys’ Makenna Mele puts up a shot against Betty Vorst of Delphos St. John’s during Tuesday night’s game in Delphos. St. Marys’ Jill Schmitmeyer drives to the basket against Ellie Csukker of Delphos St. John’s during Tuessday night’s game in Delphos. 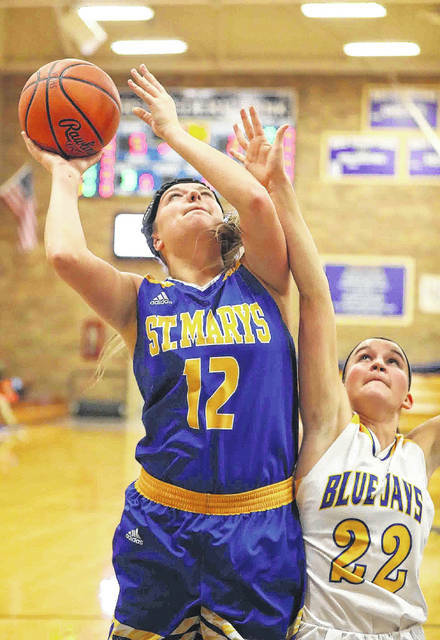 DELPHOS — Every time St. Marys seemed to be on the verge of getting back into the game, St. John’s had an answer. In Tuesday’s nonconference girls’ basketball game at Robert A. Arnzen Gymnasium, St. John’s jumped out to a lead, fought off several St. Marys’ runs in the third quarter, and then finally pulled away for a 59-32 victory over the Roughriders. Betty Vorst led St. John’s (3-1) with a game-high 17 points. Vorst also came away with a game-high 10 rebounds. Paige Gaynier scored 11 points for the Blue Jays. 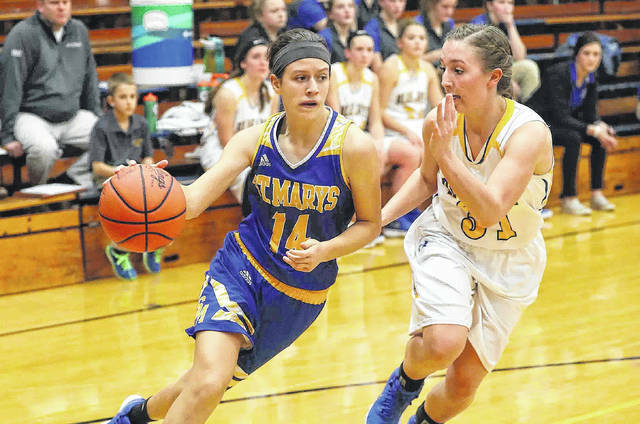 Makenna Mele led St. Marys (3-3) with 12 points and nine boards. St. John’s saw its 19-point halftime lead melt down to 9, late in the third quarter, before it finally responded and then pulled away. “We’ve been in that situation one other time at LCC,” first-year St. John’s coach Nate Stant said. “So, we knew watching St. Marys, that these guys were good, and they were going to give us a run there in the second half. The Blue Jays pulled out to a 12-8 lead by the end of the first quarter. St. John’s biggest lead of the stanza was six points. The Blue Jays really began to push the tempo after the first stop. At the 4:20 mark of the second quarter, the Blue Jays extended their lead to 12, 20-8, on a put-back by Ellie Csukker. A 3-pointer by Halle Hayes at the 2:10 mark of the second frame, pushed the Blue Jays’ lead to 23-10. Moments later, Gaynier extended the advantage to 25-10, on a pair of free throws. St. John’s kept pushing pace. Toward the end of the second quarter, the Blue Jays extended their lead to 29-10, on an inside move by Vorst. St. John’s took the 19-point lead into the halftime break. The Blue Jays outscored the Roughriders 17-2 in the second stanza. St. Marys connected on just 5-of-24 from the floor in the first half. The Blue Jays, on the other hand, were 10-of-25 from the field. However, in the third quarter, the Roughriders made a couple runs. At the 3:41 mark of the third quarter, Mele scored inside on a put-back, to cut it to 32-22. Mele then cut it to 9, 32-23, on a free throw, with a little more than two minutes left in the third. However, the Blue Jays responded, going on a 9-3 run to close out the stanza. A rare 4-point play by Vorst in the waning moments of the third quarter gave the Blue Jays a 41-26 lead, which held until the third stop. The final eight minutes of action, St. John’s outscored the Roughriders 18-6. The Blue Jays were 7-of-9 from the field in the final stanza. From the field, St. John’s shot 47 percent, while St. Marys shot 27 percent from the floor. For the game, both teams turned the ball over 17 times. St. John’s controlled the boards, 40-24. This entry was tagged delphosstjohns, stmarys. Bookmark the permalink.